The three strikers, as well as their ally, Namir Abdul Mateen, were being denied privileges granted to others on Ohio's death row. These privileges included access to online news and legal databases, semi-contact visits with family members, access to the prison commissary, recreation time, and in-person interviews with media. Three men sentenced to death in Ohio staged a twelve-day hunger strike in January 2011 with the goal of gaining the same living conditions as the 100 other prisoners on Ohio's Death Row. The men, Keith Lamar, Jason Robb, and Carlos Sanders were sentenced to death for their roles in the 1993 Lucasville Uprising, the deadly and longest-lasting prison revolt in United States history. For the last seventeen years, the three men, along with James Were, who was also involved in the Uprising, had been held in 23-hour-a-day solitary confinement. They had been barred from access to an online legal and news database, prevented from acquiring additional food and clothing from the prison commissary, and denied all physical contact with their family members. At the time of the hunger strike, Keith Lamar, who prefers to be called Bomani Shakur, Carlos Sanders, who now goes by Siddique Abdullah Hasan, Jason Robb, and James Were who goes by Namir Abdul Mateen, were being held at the Ohio State Penitentiary (OSP) in Youngstown, Ohio. They were being held in "administrative maximum security," which is the most restrictive section of the OSP. This prison was designed in such a way so as to drastically minimize contact with other living beings. 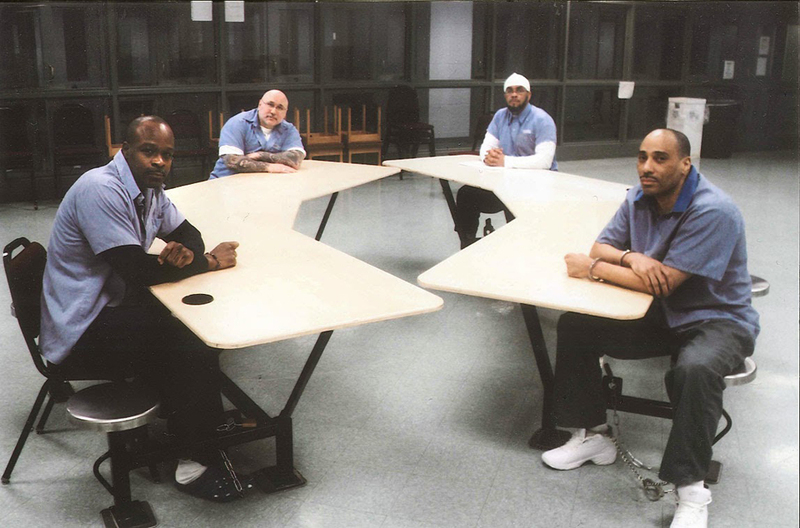 Hundreds of men have been held in OSP for short periods of time, but only Shakur, Hasan, Robb, and Mateen were being held in perpetual isolation. The three strikers demanded that they be allowed to have increased time outside of their cells (which were the size of one city parking space). They claimed to be suffering from ill health due to limited exposure to sunlight. They also demanded semi-contact visits, during which prisoners can reach through a small hole of bulletproof glass to touch their visitor's hand. Further demands included: access to the LexisNexis news and legal database, so that the prisoners could help their counsels file their appeals; in-person interviews with media; and the ability to buy extra food and warm and cold weather clothing at the prison commissary. All of these privileges were given to the other Death Row prisoners in Ohio at the time of this hunger strike. The three hunger strikers were deeply influenced by Bobby Sands' 1981 hunger strike in an Irish prison. Bomani Shakur and Jason Robb had both learned about this strike through Denis O'Hearn's book, Nothing But an Unfinished Song. Shakur had also read Richard Wright's Native Son and was reading Nor Meekly Serve My Time when the strike began. On January 3, 2011, Hasan and Shakur started their liquid-only hunger strike. Robb joined on January 4. These three prisoners convinced their fellow prisoner, Mateen, not to participate in the action due to his diabetes. At the beginning of the strike, David Bobby, the OSP Warden, insisted that he would not concede to any of the prisoners' demands. United States labor activists and attorneys Alice and Staughton Lynd, as well as Binghamton University Sociology Professor Denis O'Hearn, had been visiting the prisoners prior to the hunger strike. When the strike began, they publicized the prisoners' actions. The prisoners met with Warden Bobby several times during the strike, although the dates of these meetings are not clear. The strikers insisted on receiving a written statement from the Warden agreeing to all of their demands before they would end their strike. The prisoners most likely learned the importance of getting a written statement from the Irish hunger strikers of the 1980s. On January 13, in what Shakur believed to be retaliation for his involvement in the hunger strike, United States District Court Judge for the Southern district of Ohio, Thomas M. Rose, denied Shakur's petition for writ of habeas corpus. By January 15, 2011, 1,200 people from across the United States and around the world signed an open letter to Warden Bobby in support of the striking prisoners. The signatories of this letter included Noam Chomsky, human rights and legal scholars, and members of organizations such as the American Civil Liberties Union and the Center for Constitutional Rights. On January 14, Warden Bobby presented the striking prisoners with a signed statement outlining OSP's agreement to all of the prisoners' demands. According to the statement, most of the policy changes would take effect immediately. The semi-contact visits would begin on February 1, 2011. The prisoners also obtained phone privileges for up to one-hour per day and additional recreation time. The changes outlined in this statement applied to all prisoners held in administrative maximum security. The three strikers received the Warden's statement on January 14, and Robb ended his hunger strike that day. Shakur and Hasan continued their strike for one more day, as they knew that a vigil would be held on their behalf. On January 15, a crowd of supporters gathered in the parking lot of an evangelical church close to the OSP. According to an analysis of media reports, this was the first such gathering in support of the strike. A small group, comprised of the striking prisoners' families and advocates, left the vigil and made its way into the OSP. It was a Saturday, so Warden Bobby was off. Upon entering the prison, the group was handed Warden Bobby's statement. The OSP implemented all of the changes outlined by Warden Bobby in his statement. According to Binghamton University Professor Denis O'Hearn, "public pressure seems to have played a decisive role in winning a successful end to the hunger strike after such a short period." As the strike ended, Jason Robb told attorneys Alice and Staughton Lynd, "this time around the fight was for better prison conditions, now we begin fighting for our lives." This campaign was influenced by the Irish Hunger Strike of the early 1980's (see "Irish republican prisoners campaign for special status, 1976—1981")(1). “3 Ohio inmates end hunger strike over conditions.” The Youngstown Vindicator, January 18, 2011. http://www.vindy.com/news/2011/jan/18/3-ohio-inmates-end-hunger-strike-over-conditions/. Bukowski, Diane. “Lucasville, Ohio prisoners begin hunger strike against torture conditions in new year.” Voice of Detroit. Detroit, Michgan, January 4, 2011. http://voiceofdetroit.net/?p=3590. ———. “Support Lucasville prisoners hunger strike: phone interview with Bro. Hasan, support petitions presented on MLK Day,” Voice of Detroit. Detroit, Michgan, January 14, 2011. http://voiceofdetroit.net/?p=3590. “End ‘Supermax’ Isolation in Ohio State Penitentiary.” MRZine, n.d. http://mrzine.monthlyreview.org/2011/osp140111.html. Goodman, Amy. “Ohio Death Row Prisoners End Hunger Strike After Winning Demands.” Democracy Now!, January 20, 2011. http://www.democracynow.org/2011/1/20/headlines#12. “‘Hunger for Death Row:’ Lucasville Five hunger strike source materials directory.” D.B.A. Press, n.d. http://dbapress.com/source-materials-archive/hunger-for-death-row-lucasville-five-hunger-strike-source-materials-directory. “Hunger for Death Row: Lucasville Five prisoners on hunger strike seeking death row status.” D.B.A. Press, January 16, 2011. https://dbapress.com/archives/448. Johnson, Alan. “Lucasville riot inmates go on hunger strike.” The Columbus Dispatch. Columbus, Ohio, January 14, 2011. http://www.dispatch.com/live/content/local_news/stories/2011/01/14/lucasville-riot-inmates-go-on-hunger-strike.html. ———. “Warden concedes to strikers’ demands.” The Youngstown Vindicator, January 18, 2011. http://www.vindy.com/news/2011/jan/18/warden-concedes-to-strikers8217-demands/. Lynd, Staughton. “Hunger Strike At Ohio State Penitentiary.” ZCommunications, December 31, 2010. http://www.zcommunications.org/hunger-strike-at-ohio-state-penitentiary-by-staughton-lynd. O’Hearn, Denis. “A Welcome Prison Victory at Youngstown.” ZCommunications, January 24, 2011. http://mobile.zcommunications.org/a-welcome-prison-victory-at-youngstown-by-denis-ohearn. ———. “Inside A Hunger Strike.” Bobby Sands Trust, January 26, 2011. http://www.bobbysandstrust.com/archives/2015. ———. “On hunger strike, to be on death row.” The Youngstown Vindicator, January 3, 2011. http://www.vindy.com/news/2011/jan/18/warden-concedes-to-strikers8217-demands/. Shakur, Bomani. “Statement by Bomani Shakur of the Lucasville Uprising death sentenced prisoners.” Blogspot.com. BreaktheChains.info, January 3, 2011. http://breakallchains.blogspot.com/2011/01/statement-by-bomani-shakur-of.html. “SIGN Staughton Lynd open letter to support the Lucasville Prisoners’ Hunger Strike!” International Action Center, n.d. http://www.iacenter.org/actions/lucasville-sign011311/. "this time around the fight was for better prison conditions, now we begin fighting for our lives."